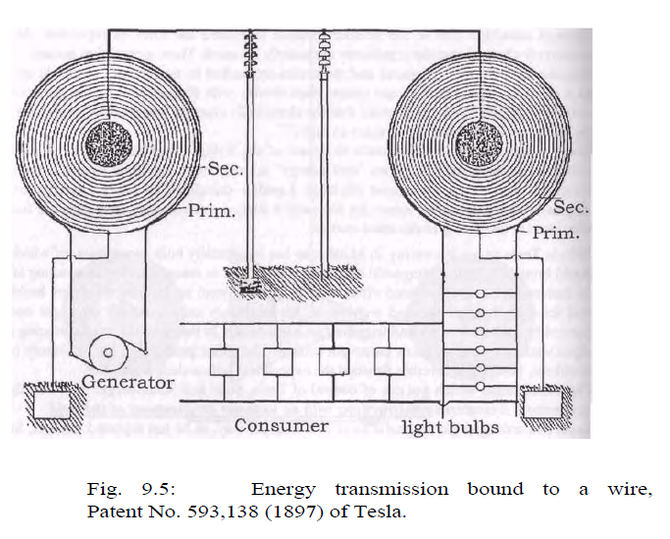 In this figure Tesla shows two additional examples of one-wire transmission. In the arrangement labeled I above, his intention is to show the effect of resonance in promoting the movement of energy along conductor L. Arrangement II diagrams a self-induction coil with a tap near one end, effectively dividing the coil primary and secondary sections. It shows one-wire transmission from the transformer’s free terminal to a single terminal lamp. In both cases, conductor L1 constitutes a part of the return circuit. Also notice the two vertical lines to the extreme left and right in the illustration. These appear to represent the walls of an enclosed space, or, perhaps, nearby parts of the general environment. Tesla’s 1897 patent drawing showing the transmission of electrical energy through one wire with ground for return (US593,138 - Electrical Transformer). It might be argued the Colorado Springs experiments also served to demonstrate the technology in advance of patent issuance. The above-mentioned patents are dated March 20 and May 15, 1900, about 7 months after Tesla’s return to New York. 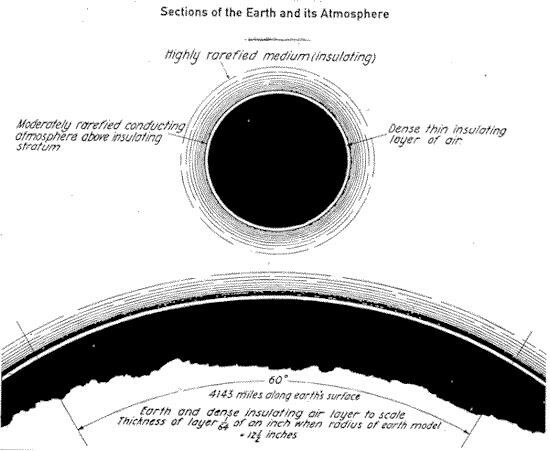 The Wardenclyffe project served to further demonstrate and refine the method and apparatus, as described in the patent US787,412 - “ Art of Transmitting Electrical Energy Through the Natural Mediums” - April 18, 1905 and US1,119,732 - “Apparatus for Transmitting Electrical Energy” - December 1, 1914.